Wind energy in the United States hit a new benchmark, reaching 50 gigawatts (GW) of electric capacity in the second quarter of 2012. The announcement was made by Denise Bode, CEO of the American Wind Energy Association (AWEA) at the National Clean Energy Summit in Los Vegas, Nevada. 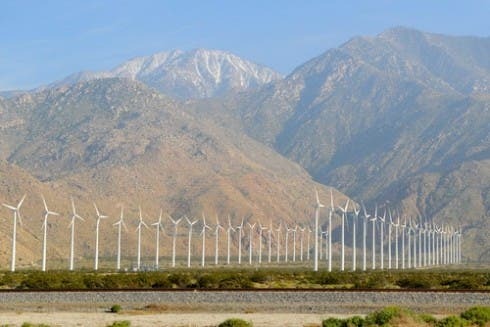 Between 1981 and 2003, 5 GW of wind power was generated. That number doubled to 10 GW by 2006, then 25 GW by 2008, and now 50 GW in 2012. Nuclear energy was the last new energy technology to reach 50 GW, done in the late 1970’s and 1980’s. The most interesting fact I found out from this infographic was that wind potential is enough to take out coal power plants in the US. 50 GW of wind provides the same amount of energy as 44 coal fire power plants, or 11 nuclear power plants. The future potential to move at a lighting-fast pace and replace these sunset energy sources is very realistic, especially when you consider that 39 states now have utility-sized wind farms, according to the AWEA. “It is amazing that 50,000 megawatts of our nation’s power is generated from clean and affordable wind energy,” Oklahoma Republican Frank Lucas Said. “This is a very big milestone for the wind industry, and I am proud the Rocky Ridge Wind Project has contributed to this great success. As a leader of Congress, representing Oklahoma’s Third Congressional District, I have supported the wind energy in the past, and I will continue to support it in the future,” he said. The impact of the wind industry isn’t just on the environment but also economically, on the domestic level. Most of the capacity growth has come from turbines made in the USA, around 60%, according to the statement. Mike Garland, CEO of Pattern Energy in the statement also agreed with the positive economic impact the wind industry has had. However, hope is on the horizon, as the Senate Finance Committee on August 7th passed the “Family and Business Tax Cut Act.” The act would help extend the PTC, vital for further industrial growth. Overall, 50GW of wind electricity capacity is something to be celebrated by everyone.